• Located on County Road F32 just four miles east of Highway 59. 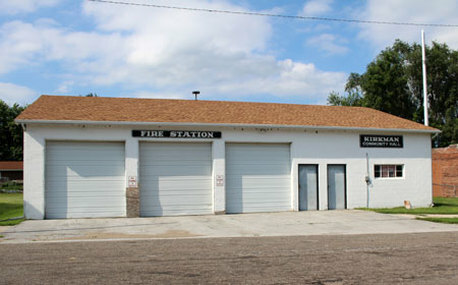 KIRKMAN was platted in November, 1880 (incorporated in 1882) and was the terminus of the Carroll branch of the Chicago & North Western Railway. 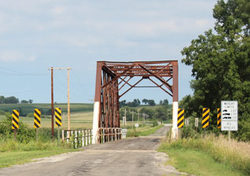 It was situated on the Nishnabotna River, known as the crookedest stream in all Iowa. A post office was established in 1881, with James W. French as the postmaster. 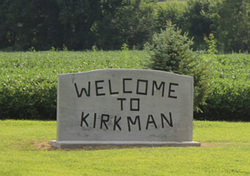 Kirkman was the birthplace of Lew Anderson, who played Clarabell the Clown on Howdy Doody. The Irwin‑Kirkman‑Manilla School System - is comprised of two campuses, Manilla, eight miles to the north, houses the early childhood center and grades 9‑12, while Irwin has the preschool attendance center and grades 2‑8. The school system regularly sends students to state competitions in band, speech, track, football, basketball, wrestling, and softball. There are active booster organizations for both music and athletics. A & E Electric, Beer Barn & Grill, J P Electric, Kienast Plumbing, Kirkman Farms and Natural Milk, Mike’s Garage Door Installation, Plumb & Sons, Prairie Hills Seeding.